Objective: Attract the attention of qualified homebuyers and achieve 1,500 interest list sign-ups prior to the grand opening. The Plan: We used the builder’s primary research (a survey and community meetings) to understand buyer demographics and psychographics. Together, we determined the buyer profile to be families and couples with an interest in technology and nature, located in the North County San Diego communities of San Marcos, Vista, Carlsbad and Escondido – areas that border a biotechnology corridor. From there, we created a 12-month drip PR campaign to build interest in the community. Our strategy was to create a continual drumbeat of local print and online mentions that addressed our key audience. We extended our media outreach not just to hyperlocal publications in the areas mentioned above but San Diego business and luxury publications, to help attract qualified home seekers who could afford a home in the new community’s price range. The builder exceeded traffic goals with more than 1,000 attendees during the grand opening weekend and several hundred visitors each week since. The target audiences are indeed those securing home sites and visiting the community. Execution: Our primary tactics were press releases, coupled with email and in-person pitching to local media, hyperlocal media and local business publications. We pitched select stories to national builder trades. Our diligent follow-up yielded in additional clips. Challenges: We received a good reminder during our campaign – always be sure that the publication you’re pitching aligns with your target audience. We worked with a TV reporter during this campaign to flesh out a segment on the new homes but the producer ultimate scrapped the segment because their viewers are budget-conscious and would be on the lookout for a freebie or special deal for viewers. Because we were brought onto the project a full year in advance, we weren’t reliant on one pitch to spell success. Informing media and consumers about the community’s construction progress through monthly press releases and/or pitches sent to targeted media, which resulted in 45 total placements, plus phone calls and interest list signups. Showcasing the two homebuilders’ innovation focus by announcing the rollout of virtual reality home tours. Media were the first to experience the tours during a “deskside” pitching session, which resulted in a 50% pitch success rate. Measurement: We measured our results in clips, sentiment and whether we achieved our objective of driving interest list signups. We shared eight unique stories and earned a total of 45 clips. Along with the advertising team, we more than doubled our goal of 1,500 interest list signups. Our lead publicist even received calls from interested homebuyers who had seen our press releases! From fall 2016 to spring 2017, PR and e-communications were the exclusive traffic drivers to the interest list until the builder implemented its print advertising schedule. There were 1,000 event attendees at the grand opening, which exceeded expectations and almost all the phase 1 homes were reserved for each neighborhood in less than three weeks. The builder applauded our efforts not only because of the interest list’s volume but because of its quality – most on the list were truly interested and able to successfully prequalify for a home. Lessons: This case demonstrates why the PR team should be brought in from the start. Though we were tasked with achieving 1,500 interest list signups, our efforts helped achieve double. Though media clips are important, true public relations should measure to outcomes – meeting an interest list goal in this case – or selling a certain percentage of homes by a set date. Because we were able to define a goal and create a year-long strategy, we were able to develop newsworthy story ideas that built excitement and resulted in getting the right people in the right homes. In 2014, we shared 10 things we love about PR. Here are 10 more reasons why we love what we do! Chance to see our words in print. It never gets old! Change – our days are very rarely repetitive – there’s always something new…whether it’s a new client, new challenge, or a new approach. Uncovering what’s exciting or interesting about a particular project, initiative, concept…and bringing that to light. The joy of working with some of our favorite people (clients and media) with whom we’ve been collaborating for years. The excitement of getting to know new personalities – even if it’s just over the phone or email at first. The perk of snazzy events…whether we’re celebrating a client’s award or milestone. A good excuse to volunteer for with some awesome organizations over the past years – PRSA, San Diego Press Club, National Association of Hispanic Journalists. Learning loads about industries we might know little about otherwise – from real estate to insurance to startups. You have bold visions for your young organization and can’t wait to see your company’s name in print. You can make this vision a reality by coming up with story ideas and “pitching” those ideas to journalists. The concept is similar to a funding pitch, but instead of proving ROI, you’re proving that your story idea will be of interest to a particular journalist’s readers. By carving out some time to brainstorm, you can pitch story ideas to the many journalists covering startup culture. Here are some questions and thought-joggers to get you started. If it’s pitching tips you seek, read this. Have you reached a fundraising milestone? Launching a new initiative/product line? Are you doing something shocking or surprising? Have you hired someone notable? Acquired a big new contract? Is your company the first to do something? Are you the only company doing it in your city? Why is what you’re doing important…right now? Timeliness is something reporters look for when they identify newsworthiness. Is there any timeline associated with your work? A season that’s more active than another? New data that shows a concerning trend you’re trying to remedy? Try going in on a story with similar-but-different organizations. Are you making a product for the education sector? Gather some others in your space and pitch a roundup featuring the five of you. You can find journalists who cover your space and send them a quick rundown (think bullets, use your business pitch skills) of why you’d be a credible source and include some topics you can comment on. Just make sure when you do respond to questions, that you provide short, quotable quotes. Another tack is to ask those same journalists what they’re working on and how you can help. We suggest you get familiar with the journalists who cover the startup space by reading their work. This will most likely inspire additional ways to approach getting your name, or your organization’s in print and online. Got questions? Email our Lead Publicist, April Enriquez who has spent the past several years reading articles about startups and pitching stories surrounding startup culture. Julia here, WordPop’s PR consultant. For the past 10+ years, I’ve been a PR pro and yoga practitioner. A few years ago, I added “certified yoga teacher” to my credentials. Balancing between the two sometimes opposing roles of PR practitioner and yogi got me to thinking…what do they have in common? As it turns out, it’s a lot! Yoga isn’t just good for strengthening your body – here are 9 PR skills you can strengthen through yoga. Persistence – When I wanted to pop into a headstand in the middle of the room, without toppling, a teacher suggested I practice every. single. day. By applying this advice, I now stand topsy-turvy with confidence in the middle of a room full of yogis. PR can take similar persistence – never underestimate the power of follow up when you have a good idea and the right set of ears. Flexibility– I’m a planner and I like things to go as planned. This mental inflexibility mirrors my tight and inflexible muscles. As a yogi, I’ve found stretching consistently works to lengthen and maintain flexible hamstrings. As a PR pro, I’m constantly stretching my brain muscle to problem-solve when things don’t go according to plan. I also create a plan b (and maybe even a plan C), which makes things easier, when…inevitably…things go off course. For example, if we don’t get content approval in time, can we re-pitch what we’ve gathered at a later date or to a different reporter? Detachment from ego – When you’re trying to twist into a pretzel but you’re more of a dough ball, it’s helpful to detach from your sense of pride. Contrary to the myths perpetuated by Instagram, yoga is not about competing with the people around you or even comparing your body today to the way it was yesterday. It’s about accepting yourself as you are in the moment. As a PR pro, it can sometimes feel like your pitches are getting sucked into a black hole, but detach from your sense of ego. There are plenty of reasons why stories get passed by (something more urgent, a jam-packed inbox, time of day). As long as you’re sending relevant pitches to the right people, be persistent and don’t let a lack of response get you down. Discipline and enthusiasm – In yoga, these two are interconnected and driven by core strength. Translate that burning-abs feeling into fiery enthusiasm or passion for each endeavor you undertake. By strengthening your core, you can tap into your innate sense of discipline that helps you get things done in your busy professional life. As a PR pro, you have to stoke your fiery-passion for every single pitch in an effort to convince a journalist that their readers or viewers will view the topic with similar enthusiasm. Support from your kula – Your “kula” is your community. Through professional organizations and graduate school, I’ve cultivated a group of brilliant PR minds that I’ve tapped as resources on a number of occasions to help brainstorm solutions that worked. It’s also helpful to have good relationships with other local PR pros, especially those in similar industries, because we often collaborate. 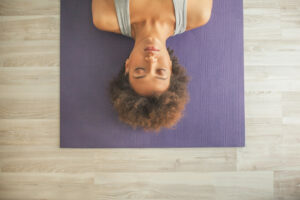 Intention setting– I usually kick off a yoga class by asking students to close their eyes, become aware of their breath, and set an intention for their time on the mat. This is a critical first step to any PR campaign but it can sometimes get lost in the shuffle. Sometimes we learn about an initiative later than we’d like and we’re scrambling to catch up but it’s critical to take a step back. What’s the point of this initiative in the first place? By setting clear goals, you can make sure you are spending your time wisely and can identify success when it happens. Seeking insight from the primary texts– Patanjali’s Yoga Sutras are a series of 198 aphorisms that form the foundation of our modern yoga practice. They’re a distillation of a bunch of other foundational texts…basically the ancient version of tweeting at conferences. Just as it’s important for yogis to crack a book from time to time, it’s important for PR pros to make the time to eat up the foundational texts of our profession. The AP Stylebook, Strunk & White’s The Elements of Style and Crystallizing Public Opinion by Edward L. Bernays are all worthwhile. Quiet your monkey mind! Speaking of Patanjali’s Yoga Sutras, one of the first sutras (in sanscrit) is “yogaś-citta-vṛtti-nirodhaḥ.” Translation: the purpose of yoga is to quiet your churning mind. We all have those days where we have flagged three hot items for the day, but somehow, even more urgent items keep piling up in the mailbox faster than we can read them. Here’s a tip for handling the chaos. It’s counterintuitive but separate yourself from the inbox. Take five minutes to close your eyes and notice your breath. You can even intentionally breathe in for four counts, out for four counts. Repeat, reset.